St Peter, Kirkgate, Leeds.. Listed Building. R.D. Chantrell (1793-1872). 1837-41. Built for Dean Hook, who was the vicar from 1837-59; described by Christopher Webster in Pevsner as: "Internally, probably the country's most important church of its date, and largely unaltered" (398-99). This is because of Chantrell's innovative placing of the tower, making it a town landmark; its Gothic battlements, pinnacles, tracery and so on, situating it somewhere between the Decorated and Perpendicular styles; and its spacious east end, allowing for the new practice of Anglo-Catholic ritualism. Left to right: (a) Close-up of the tower. This is widely visible even though the church is rather far from the town centre. 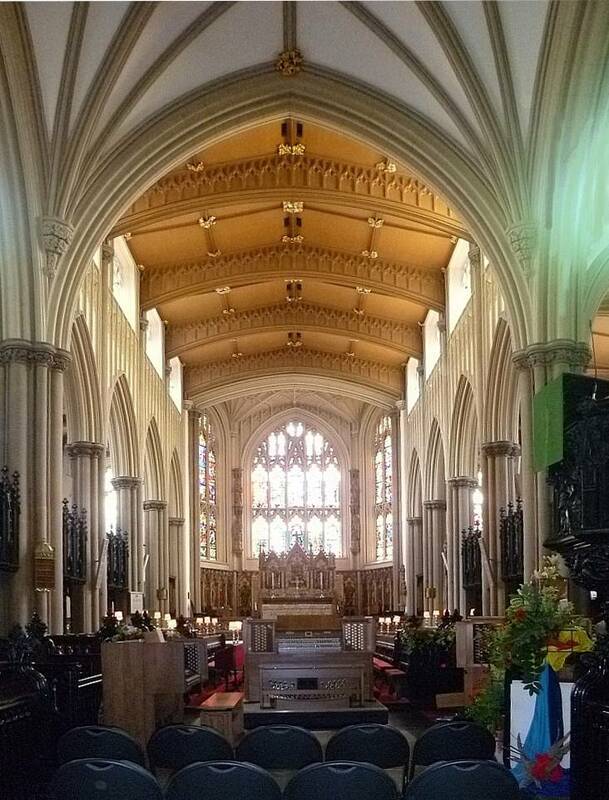 (b) View towards the east window. 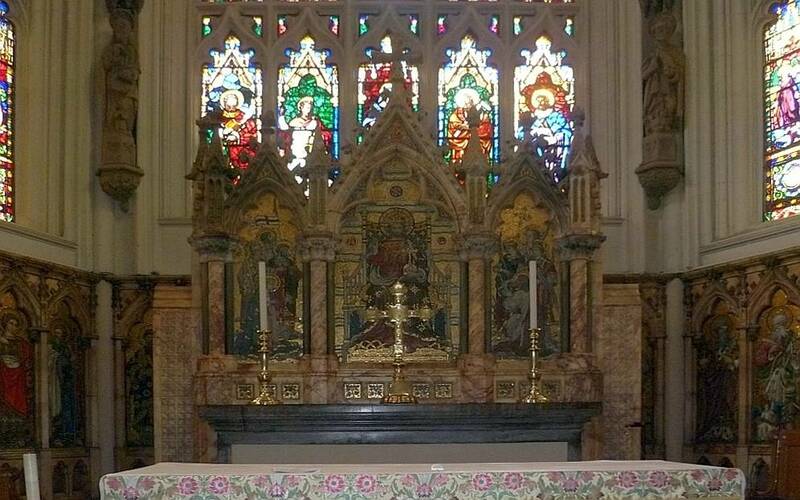 (c) Close-up of reredos. 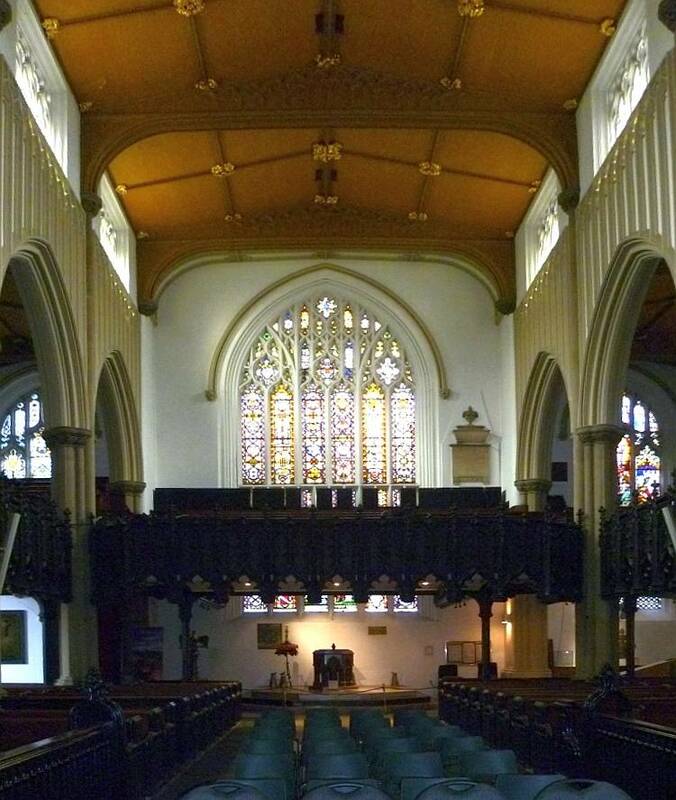 Several major church designers and craftsmen were involved: here it was designed by G. E. Street, has mosaic-work cartooned by Clayton and Bell, and was carved by Earp and Rust (see Webster, "St Peter, Kirkgate," 400). It is a measure of the importance of the church that such names should have been associated with it. For example, the new font of 1883 (not shown here) was designed by William Butterfield. Left to right: (a) Organ case. This faces the entrance through the tower. 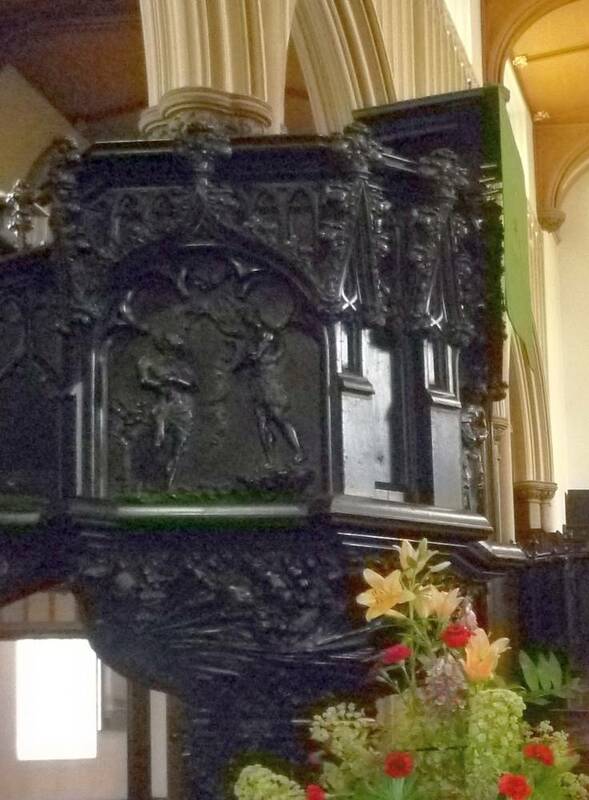 Remarkably, what looks like heavy woodwork in the church is often papier mâché, painted to look like wood, or cast-iron — the latter, for example, was used for the decorations on the pew-ends. (b) The west end. 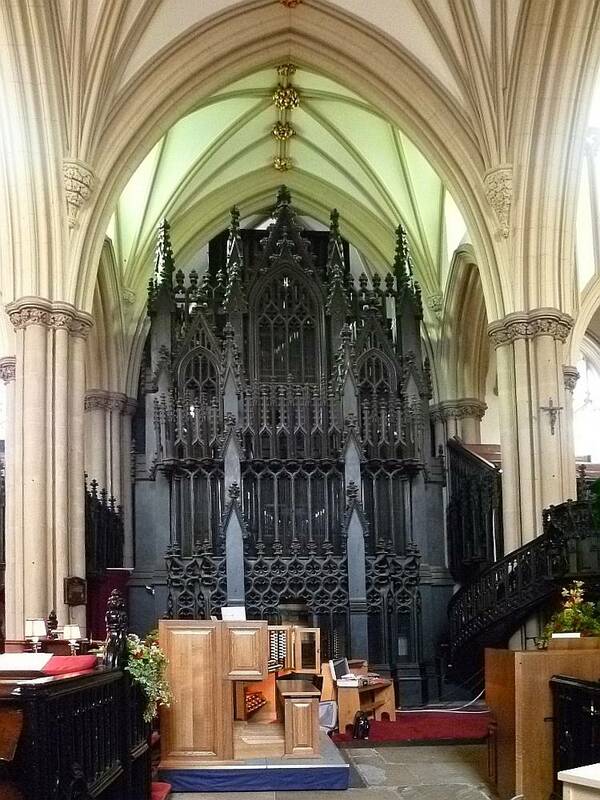 This is more early Victorian in feel, with its heavy gallery and the importance given to the pulpit. (c) The heavy pulpit, designed by Chantrell himself. 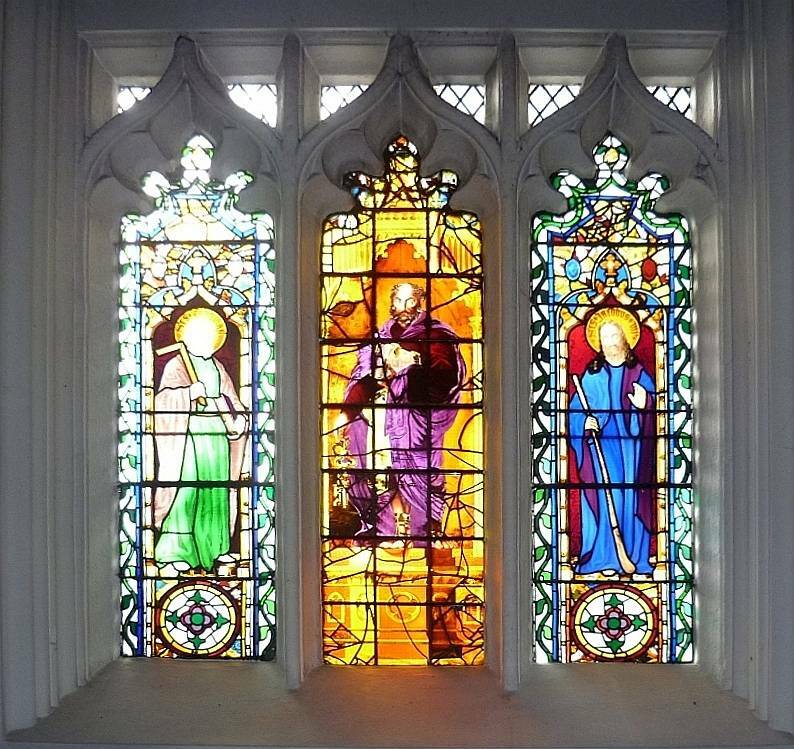 Left to right: (a) South aisle window with the central light showing St Peter, flanked by St Thomas and James the Great.. 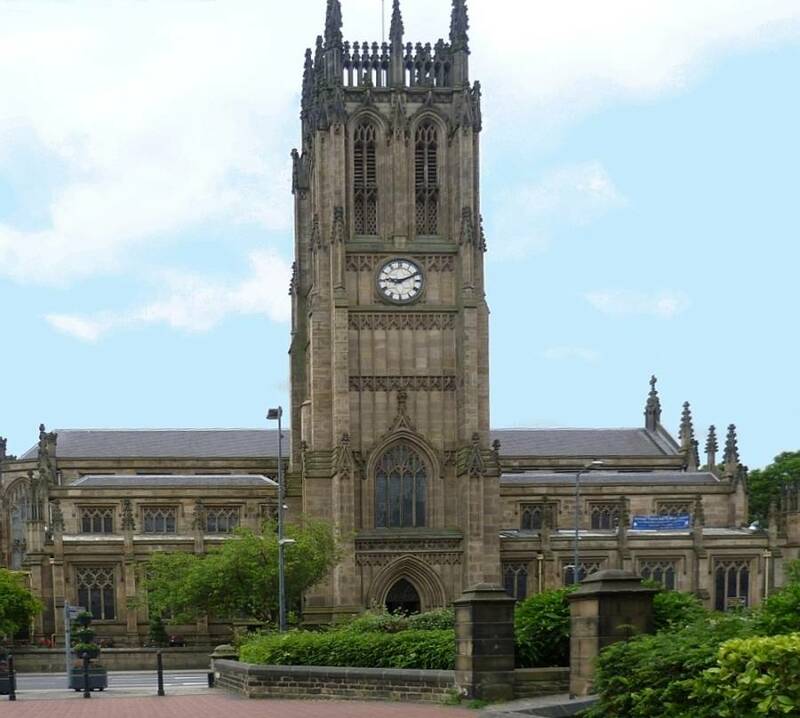 Unexpectedly, the brightest figure here, St Peter, comes from the original church, and is dated 1811, by Wright Brothers of Leeds, designed by Schwanfelder. (b) The attractive geometrically designed "Penny Window" from 1841, in the Leeds City Room, for which the poor subscribed. This was one of several similar in the church by John Bower. (c) Hall window. Under these lights are the following texts, left to right: "Ye must be born again"; "Receive thy sight"; "I will give thee living water." 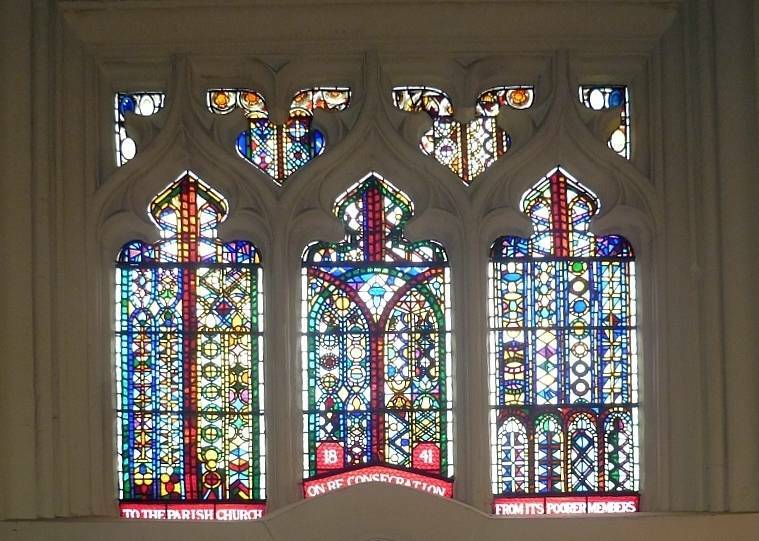 The windows are by various designers, and even include one designed by E. M. Barry and made by Wailes (see Webster in Leach and Pevsner 401). 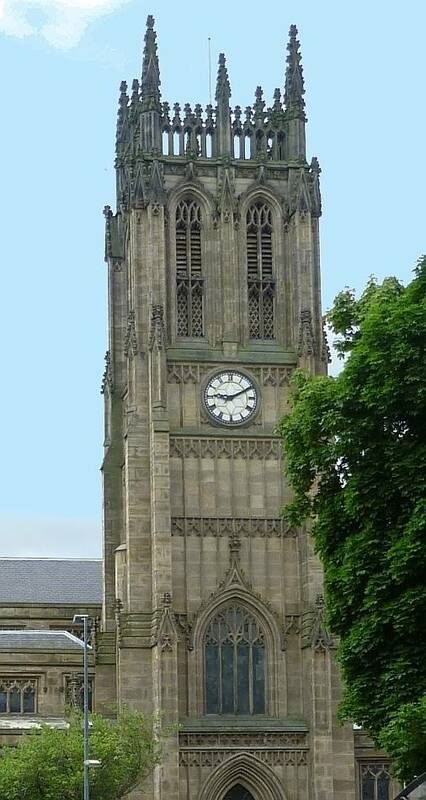 Parish Church of St Peter, Leeds. British Listed Buildings. Web. 9 March 2012. Stanton, Phoebe B. 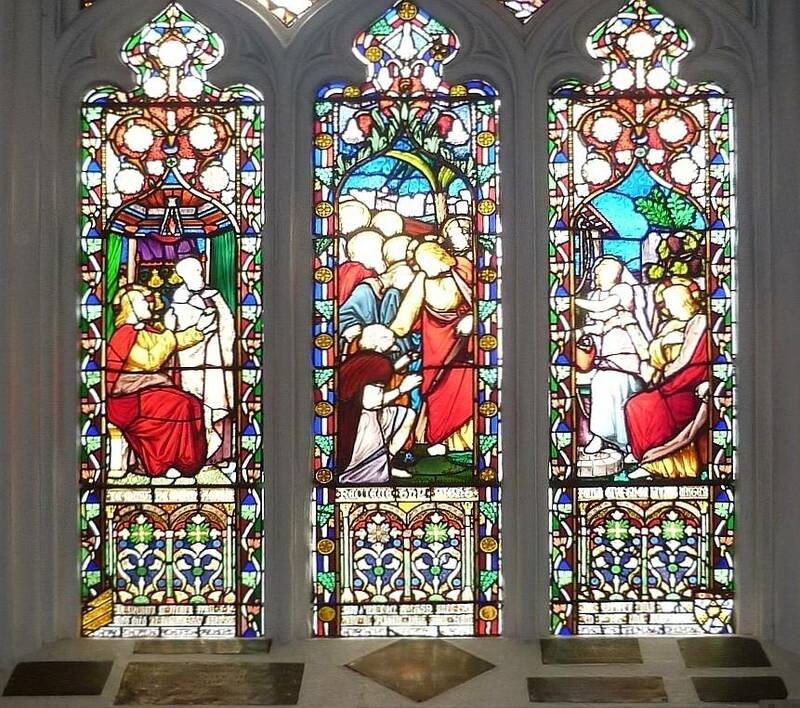 The Gothic Revival and American Church Architecture: An Episode in Taste, 1840-1856. Baltimore: Johns Hopkins University Press, 1997. Print. Webster, Christopher. "Robert Dennis Chantrell (1793-1872)." Building a Great Victorian City: Leeds Architects and Architecture. Huddersfield. : Northern Heritage Publications in Association with the Victorian Society, 2011. 99-116. Print. Webster, Christopher. "St Peter, Kirkgate." Buildings of England: Yorkshire, West Riding: Leeds, Bradford and the North.. Eds. Peter Leach and Nikolaus Pevsner. New Haven: Yale University Press, 2009. 398-402. Print.